The pink smoke ring occurs only on the outside edge of the meat because the nitrogen gas absorbs from the outside in. Typical smoke rings will be 1/8 to 1/2 inch deep. Want to achieve that 1/2 inch ring? The key is moisture. The dissolved gas can’t go very far into the meat if the surface is bone dry. Mopping your prized brisket or ribs creates a sticky surface that acts as a vehicle for the nitrogen dioxide to move deeper into the meat and helps grab more gas from the smoke. So if you’ve ever wondered why some pit masters are so insistent on mop sauces, it’s not just for extra flavor or moistness. It actually leads to a deeper smoke ring. According to Tom Mylan, of The Meat Hook, failure to form the sticky outer layer on the meat will result in a “sooty, gray-brown color” (meaning no smoke ring). Soaking your wood chips will help as well. Burning water-soaked wood produces more nitrogen dioxide. If natural smoke isn’t giving you the ideal ring, there is a way you can cheat. A dusting of pink salt or any curing salt with sodium nitrite (one common brand is TenderQuick) in it will produce the pink color you’re looking for. (You’ve probably seen this effect in cured meats, like ham or hot dogs.) But don’t count on it helping you win competitions. Aware of the fact that not all smoke rings are achieved by wood smoke alone, the Kansas City Barbecue Society has ceased making a smoke ring one of the criterion for professional judges. Do you have a smoke ring tale to tell or a gorgeous photo to show off? 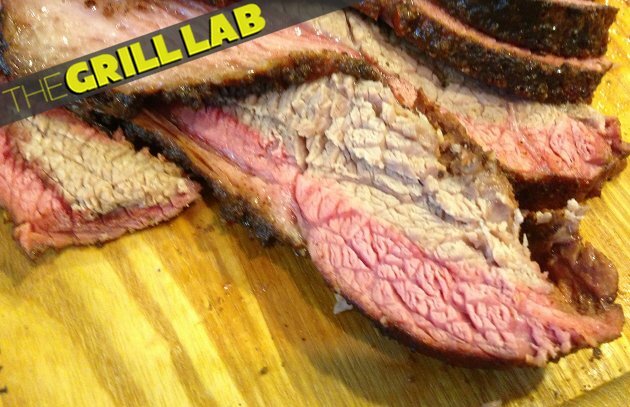 Let us know on the Barbecue Board and post photos of your best smoke rings.